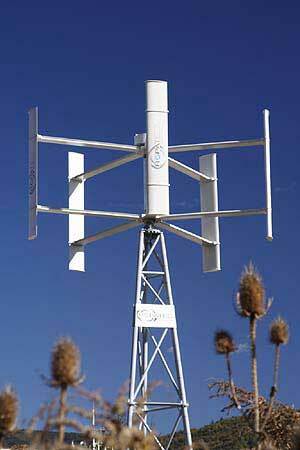 Wind turbines convert the kinetic energy from wind into mechanical energy. When used with an electrical generator, the rotation of the wind turbine’s blades turns a shaft to produce electricity. There are two basic types of wind turbines: horizontal-axis and vertical-axis. Vertical axis wind turbines (VAWT's) are different from traditional wind turbines in that their main axis is perpendicular to the ground as opposed to horizontal. Their operation somewhat resembles a water wheel on it’s side, but uses the power of the wind rather than the flow of water. The nature of VAWTs makes them ideal for both rural and urban settings. These turbines offer the individual or organization an opportunity to offset the rising cost of electricity and to have an impact on the environment around them. 1. VAWTs are not influenced by wind direction, which is useful in areas where an inconsistent wind direction is found. Unlike traditional horizontal axis turbines, a yaw mechanism is not needed to turn the turbine into the wind. 2. Efficiency is not reduced by turbulent air flow often found around buildings and other tall structures. 3. Ideal for rural, isolated and urban applications, including roof top installations. In fact, depending on the shape of the roof, the turbine wind flow over the roof can increase the power output. 4. Simple to install and maintain. 6. They are not needed to be placed high in the air, which helps in staying within building codes. want to know how strong the wind is in your area? The accompanying graph shows the wind speed measured in m/sec in East London today. N.B. An internet connection must be available to receive the updated data.